The last has not been heard about the crisis in the health sector as the Nigerian Medical Association, NMA, will today hand the Federal Government a 21–day ultimatum to tackle the myriad of challenges and anomalies confronting the country’s health system or face another industrial action. This is coming on the heels of the suspension of a nine-day indefinite strike by the Medical and Health Workers Union after government agreed to their demands. 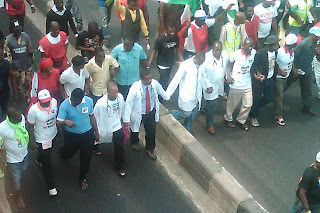 However, Nigerians may now have to contend with the new threat by the umbrella body of doctors in the country. The communique, jointly signed by the President, Dr. Osahon Enabulele and the Secretary-General, Dr. Akpufuoma Pemu, said the non-negotiable stance of NEC is the enthronement of professionalism and international best practices. It said: “NEC resolved not to further tolerate the dislocation and unqualified suffering of doctors and other health workers, who are being owed salaries due to non-payment of wages occasioned by recurrent irregularities in the implementation of the centralised integrated personnel payroll information system, IPPIS. “Since the commencement of the implementation of IPPIS in federal public hospitals, it has greatly undermined the welfare of doctors many of whom have had to endure over three months of non-payment of salaries due to the irregularities in the implementation of IPPIS. They also mentioned the delay in the inauguration of the Governing Board of the Medical and Dental Council of Nigeria, MDCN, despite several appeals made by NMA to Government. The said that MDCN remains greatly handicapped by the fact that there was no judge/council chairman to preside over investigated cases brought before it.